Poffertjes machines went through a bit of a craze over Christmas, every catalogue featured one and many, many shops had awful bulky machines for sale. The kind of speciality machine that gets pulled out every once in a while and used to make things that will never be appreciated to their full extent. Coupled with the frenzy for the machines, there was a frenzy for pre-packaged poffertjes mix. I've tried pre-packaged poffertjes mix myself (it came with my poffertjes pan, needless to say) and didn't find it particularly impressive. I'm by no means immune to the ease of pre-packaged mixes - or the lure of owing a poffertjes pan, or that matter. I justify mine by telling myself: well, at least it's smaller than an electric machine. I say this about my crepe pan and waffle iron too, why one person needs so many speciality kitchen... things, I don't know. It's quite tragic, really. It saddens me to think that the many, many people who bought poffertjes pans will only ever use pre-packaged mix. It's not the fact that it's pre-packaged that saddens me, it's merely that poffertjes made with yeast taste so, so much better. 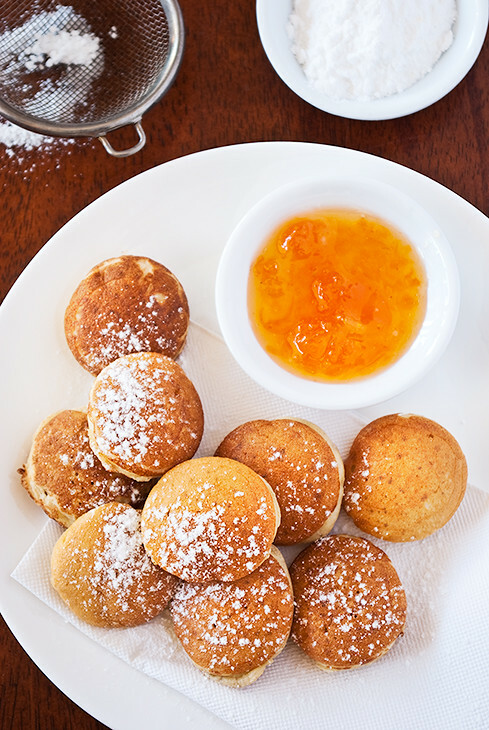 When made with yeast, poffertjes are just like little doughnuts. Yum! Sure, pre-packaged mixes are easy but so is this recipe! Admittedly, you do need prepare the batter in advance as the recipe contains yeast. In the grand scheme of things an hour isn't a long time and, if you can't spare an hour, you can always make the mix the night before and leave it in the fridge to mature. By the time you wake up, it'll be ready to go. The thing I like about poffertjes is that, once the mixture is made, they're quicker than pancakes to make. By the time you've finished squeezing the batter into the holes, the poffertjes are ready to be turned. There's hardly any waiting around. It's bam, bam, bam, done! Not to mention people are always seem to be exceedingly pleased when you feed them poffertjes. They react as though you've made something difficult, when you've actually made something even easier than pancakes. So, essentially, this recipe is quite fantastic. If you have a poffertjes pan that's crying out to be loved, I implore you to pull it out and make some poffertjes totday. You won't be disappointed. The jam is by no means mandatory but it's pretty delicious. In a small saucepan over low heat, or in the microwave, combine the milk and golden syrup. Heat the milk until it is lukewarm. Stir to dissolve the golden syrup. Combine flours, dried yeast, lemon rind, and a pinch of salt in a large bowl and whisk to combine then make a well in the centre. Add the eggs and half the milk mixture, stir until the batter is smooth. Add the remaining milk and beat, using a spoon, to combine. Cover and stand in a warm place for 1 hour. Alternatively, cover and place the mixture in the refrigerator overnight. Transfer poffertjes mixture to a large sauce bottle. Heat poffertjes pan over medium high heat. Brush a bit of butter into each cavity and then, when it is sizzling, fill each cavity with batter. Cook for 1-2 minutes, then turn and cook for an additional 30 seconds, or until cooked through. 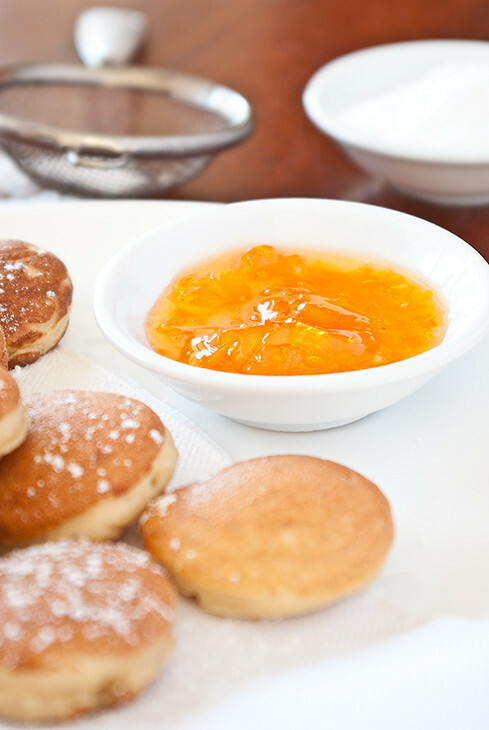 Dust poffertjes with icing sugar and serve with mandarin jam. Break mandarins into pieces and combine in a large saucepan with all the remaining ingredients. Stir over medium heat until the sugar dissolves. Bring mixture to a simmer and stir occasionally until the mixture is thick and jammy, about 15-20 minutes. Transfer to a sterilised jar, cool, and then refrigerate until required. I saw these on GT and am really looking forward to trying them, too - yours are beautiful! And that jam... Yum! Patricia: You should definitely make them - I think you'll like them. They were quite delicious!